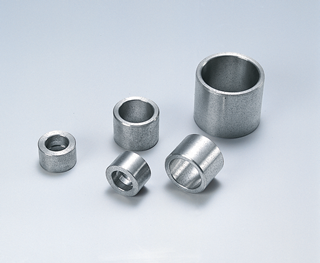 The Oiles 2000S series are self-lubricating bearings made of a newly developed special alloy, where solid lubricant mainly made of graphite is dispersed impregnated with more oil. ■ Serviceable without the need for lubrication. Demonstrates higher performance when greased. ■ Distributed solid lubricant allows motions in any direction. ■ Features low coefficient of friction and quite superior wear resistance. ■ Lower prices than bearings with copper alloy bases. * The 2000S was renamed from the 2500.